After our "city day" in Des Moines, we were eager to head back out to the small town roadside attractions that we love so much. 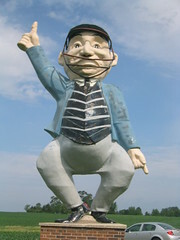 The World's Largest Umpire in Ryan, Iowa seemed like a good stop. I took the exit that Krisity indicated and we expected to see a "Welcome to Ryan" sign and maybe even the Umpire itself near the roadside. The town was SMALL as indicated by the size of the text on the map, so we thought it was no-brainer. We whizzed down the road for a while and Kristy said, "Hmmm, I think we may have passed the town." "What?" I said, "I didn't see any town." A few minutes later after some mileage calculations she said, "We've definitely gone too far. Look, the town looks like it's a little west of the main road." So we turned around and headed north again and turned west on the only road we'd seen between there and the highway. It was bumpy and unpaved. We drove past miles of cornfield with the occasional farmhouse and streets named things like, "1001 1/2th Lane." "Hmmm," said Kristy, "I think this is wrong." So we turned around and crossed back over the main road. . . Little dots on maps are easy to mess up, so we figured the town must be right on the other side of the road. Bumpity bump we went over miles of dirt road. Oh, and we were running low on gas. "Hmmm, I said, I think this is wrong, too." We needed gas and decided to give up. . . As we drove back toward the highway, we noticed the driveway for an agricultural co-op. It had what looked like an access road coming off the side of it. We turned, and voila, we were in the heart of Ryan!! We drove down the main street and there he was, the giant umpire. He sits on the town baseball field and was originally from the Big Boy restaurant, but was retrofitted with umpire-wear. And then we were back to the highway. An hour later.